The GPhC has planned revalidation for years and it is finally reaching pharmacy professionals – are you ready for the change? As of March 30, revalidation replaced prior forms of recording a pharmacy professional's continuing professional development (CPD) as the way in which the General Pharmaceutical Council (GPhC) verifies that registrants – both pharmacists and pharmacy technicians – are fit to practise. The biggest changes that you will encounter through revalidation are: when you are required to submit learning; the type of learning you submit (planned/unplanned, peer discussion and reflective account); and where you record your learning. When are you required to complete revalidation? How does the submission for revalidation differ from previous CPD entries? What records are required for your revalidation? What is a peer discussion? What is a reflective account? Why do you need to consider confidentiality in your submission? What is your timeline for revalidation? When will you receive your login details? 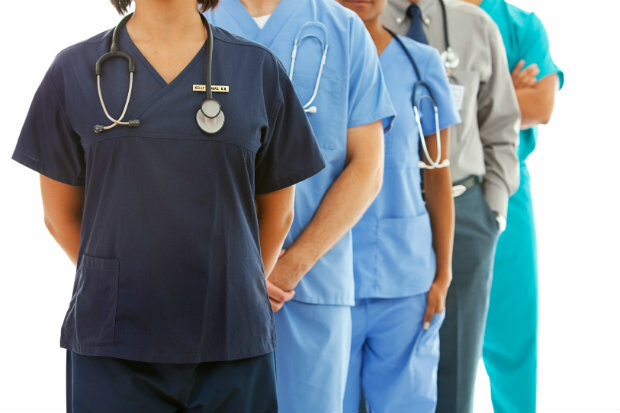 Why doesn’t everyone complete revalidation at the same time? Will all records be reviewed each year? Who reviews your revalidation submission? What happens if you have problems with submitting your revalidation records? What happens to your records on the uptodate website? Is pharmacy the only profession to undergo this change? 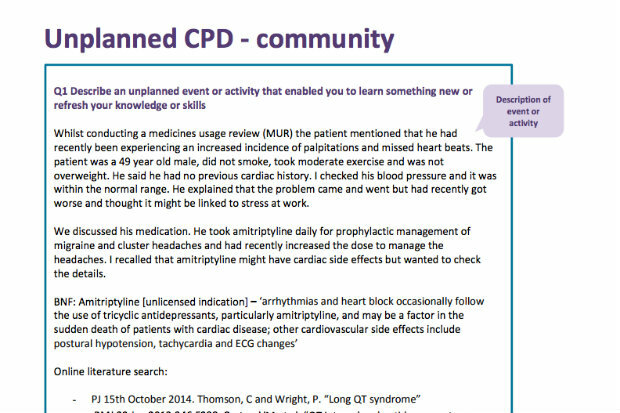 The previous model of completing CPD was to log your learning on the GPhC’s uptodate.org.uk website. You were required to submit CPD when called by the regulator – this was not done annually. In contrast, as part of the GPhC registration renewal process fitness-to-practise declarations were required on an annual basis. 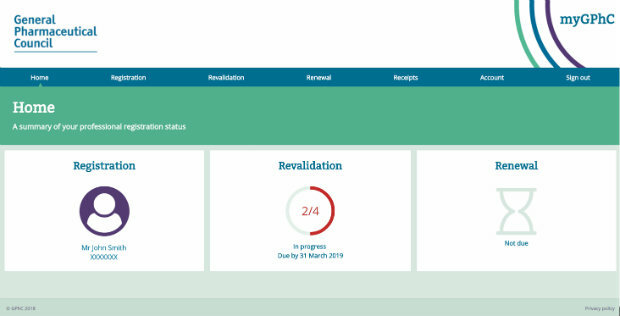 Under revalidation, you are now expected to submit a set number of revalidation records (see How does the submission for revalidation differ from previous CPD entries?) annually when you renew your registration. There is a two-month window to do this; for example, someone whose registration renews on October 31 will be able to submit their records, pay their fee and make their fitness-to-practise declarations from September 1 onwards. Previously, CPD records were submitted onto the GPhC’s uptodate website. This involved completing your entry under the following subsections: reflection, planning, action and evaluation. This has been superseded by the new recording format for revalidation, with different entry fields depending on whether you are completing learning as either a planned/unplanned CPD entry, a peer discussion record or a reflective account record. Although registrants will have different timelines for completing their revalidation (see Why doesn’t everyone complete revalidation at the same time? ), in your first year of revalidation the requirement is for four CPD entries to be submitted, at least two of which must be around planned activities – where you decide to develop your knowledge and/or skills in advance of undertaking a learning activity. The myGPhC portal – which is being updated to enable functionality beyond simply renewing your registration, as was previously the case – must be used for this, not the uptodate.org.uk website. CPD entries are expected to cover three aspects: what the learning is, the form it takes (for example, reading journal articles, attending a workshop), and the impact it has had on patients and the public. For more information, see What should you record? There is no limit to the number of CPD entries that can be logged in a given year – and the simpler format is designed to make the process considerably quicker and easier than it was previously – but only four of the entries will need to be submitted when renewing registration and making annual declarations. To see examples of what should be recorded, see What resources are available?. The peer discussion is a development activity introduced as part of revalidation to encourage pharmacy professionals to reflect upon their practice with someone who understands their work, with the aims of gaining another perspective and reducing professional isolation. The GPhC has advised that for a peer discussion to be effective it should be “open, honest and with someone who you trust and respect”. Peer discussions can take place in any live format; for example, face to face, over the phone, via web chat, a video call or any other means of realtime communication. It is important that whoever you choose to complete your peer discussion with understands aspects of work you do; for example, an individual you work with; someone with a similar professional background; or a colleague from a multidisciplinary team. You are free to select your own peer and you must not have a one allocated to you by someone else, unless you are comfortable with the selection. The GPhC will ask you to make a declaration when you renew your registration to enusre you selected your peer yourself. The regulator has also indicated that you do not have to send it information on the subjects discussed in your peer discussion. Instead, it wants the conversation to aid your reflection and help highlight issues you might not have considered on your own. You must ensure your peer has agreed to be named in the record of your discussion, and is able to be contacted about it. The reflective account should describe how you have met one or more of the GPhC’s standards – the exact standards will be determined by the regulator on a yearly basis (see Why doesn’t everyone complete revalidation at the same time?) – with examples given of how this has affected “service users” (eg patients/public). All registrants for a given year will be given the same standard(s). real-life examples to support your statement. 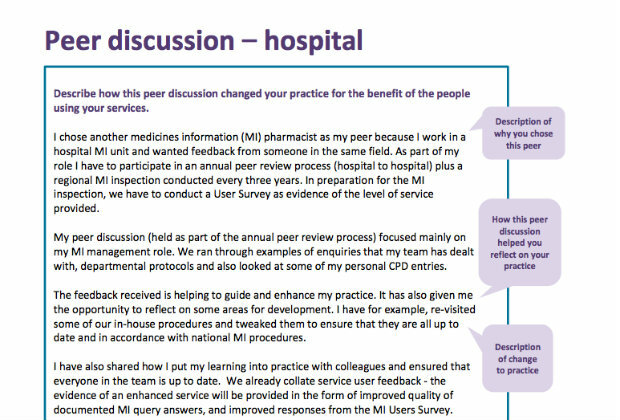 Peer discussions and reflective accounts will need to be logged at mygphc.org. However, during the first year of revalidation submissions, the GPhC will not require either a peer discussion or reflective account from registrants. For more information on the development of revalidation, click here. The GPhC has stressed that it is important your records reflect your sphere of practice. This is to ensure that you are working towards improving your practice across all of your roles. For example, if you split your working week between both a GP surgery and a community pharmacy then you must have records that relate to both. If you do work across several different roles, you may find it difficult to relate to each role within your first year, as you are only able to submit four records. The GPhC will take account of this fact, but will expect a greater spread of entries relating to your various roles when you submit six entries in your second year. The GPhC wants registrants to use real-life examples of how you have put your learning into practice to benefit people using your service (eg patients/public). See What resources are available? for further information. While the real-life benefits you have provided – rather than hypothetical gains – for these individuals should be included in your revalidation records, it is vital that patient confidentiality is maintained. 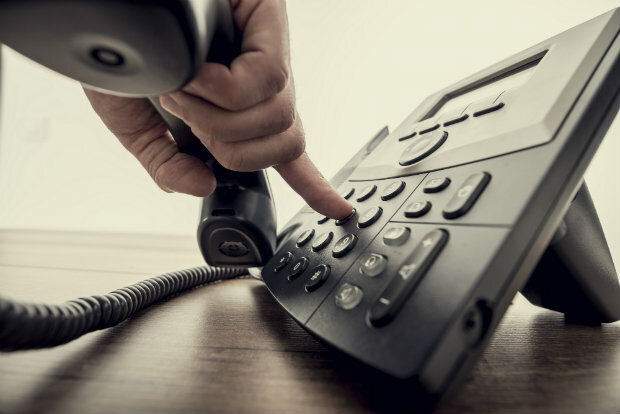 For example, if you submit details of a service you undertook, the record should not provide information relating the identity of a patient, as the GPhC is a third party and as such is not privy to this confidential information. By neglecting to anonymise patient details, you will potentially be at risk of breaching the GPhC‘s standard to “respect and maintain confidentiality and privacy”. In the first year that you submit revalidation records, you will need to carry out and record four CPD records, and submit them when your renewal is due. The following year, you will need to submit revalidation records consisting of four CPD records (two of which must be planned), a peer discussion record and a reflective account record. 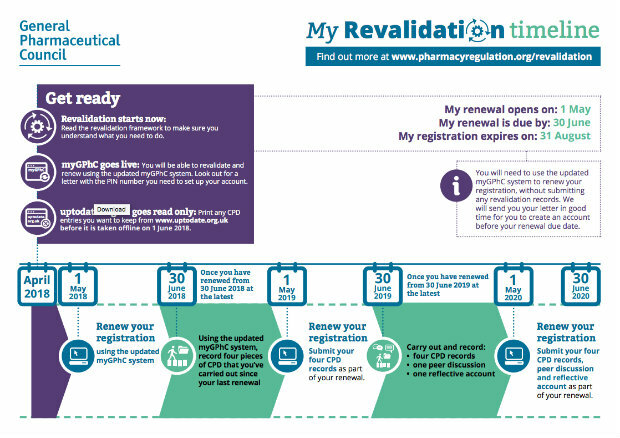 You should be aware that when using the updated myGPhC system, registrants completing revalidation in their first year (see Why doesn’t everyone complete revalidation at the same time?) will not be able to create entries for either a peer discussion or reflective account. This is to help prevent confusion and allow registrants to adapt to the new requirements. The GPhC has begun sending out letters to all registrants, containing their PIN and details of how to sign up to the new version of the online portal. 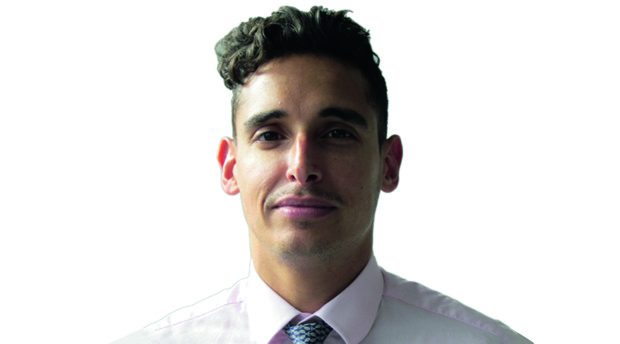 The GPhC’s Mr Ammar states: “We have a rolling register, as required by legislation, and pharmacy professionals can join the register on either the 1st or 15th of each month.” A rolling register involves the initial registration period lasting for one year from the date of initial entry to the register – for example, a pharmacist who first joins the register on September 1, 2017, will be registered for one year, until August 31, 2018. As the date of your renewal will change depending on when you joined the register, your date for submission of records will likely differ from your peers. While all registrants will have to submit revalidation records each year when renewing their registration on the rolling register, only some of these will be reviewed, on a random or targeted basis. The previous cycle that would dictate when you would be called has been replaced by “random selections every year”, which means anyone can be called. The only way you can be confident you won’t be called is if you were contacted within the previous two years and completed the process with no problems. However, if your submission had problems and you were put into remediation (a second attempt at meeting the GPhC requirements) you will be called the following year. If you are called, you will be notified and will subsequently receive personalised feedback. In addition, those not called will receive a summary of the feedback of the records that were called that year, so you are able to benefit from shared learning. Records will be reviewed against core criteria; for example, whether the correct number of entries has been sent in, and if patient confidentiality has been preserved (see Why do you need to consider confidentiality in your submission?). The records you submit for the revalidation process will normally be kept for a period of two years; however, the GPhC may retain them if it come across problems with your prior submissions or if your fitness to practise is being investigated. This means that it is wise to maintain your records post-submission. The GPhC has proposed that each review of registrant records will be carried out by two individuals: a pharmacy professional and a lay reviewer. It told C+D that the use of lay reviewers will help “reflect the voice of patients and public” using pharmacy services, and bring skills “similar to our current reviewers, many of whom come from an educational background”. If you are unable to submit the required records, for example, because of taking parental leave, you should notify the GPhC. It may allow you to put forward a reduced number of records when you renew your registration, or it may grant you an extension – decisions will be made on a case-by-case basis. However, if the regulator deems that you don’t have a suitable reason, it will ask you to submit everything as normal, although you will have the right to appeal its decision. If your records are judged to not be of the required standard – and this can include not having been submitted in the first place – in most cases, an opportunity will be provided to submit or redo the necessary forms. If, following this action, your submission is still not regarded as being up to scratch, the GPhC will start the process of removing you from the register. At this point, you can put forward any relevant information and/or appeal the decision. Find more information about the appeals process here. As of April 1, 2018, you are no longer able to create or save new records to the Uptodate.org.uk system – although you will still be able to view them on a read-only basis for a short time, until June 6, when the system is closed down and all records will be deleted. Although CPD records will not need to be submitted in order to meet revalidation requirements, you may want to retain the logs you have made at uptodate.org.uk, perhaps as evidence for a work appraisal or simply as documentation of the CPD you have done over the years. If so, printing or saving entries in PDF format appears to be the only option and must be done by the end of May – after this date all records will be deleted. Find out how you can print and download your CPD entries here. If you record your CPD on C+D’s Update Plus learning platform, you will continue to have permanent access to the CPD you have recorded in your ‘learning record’. 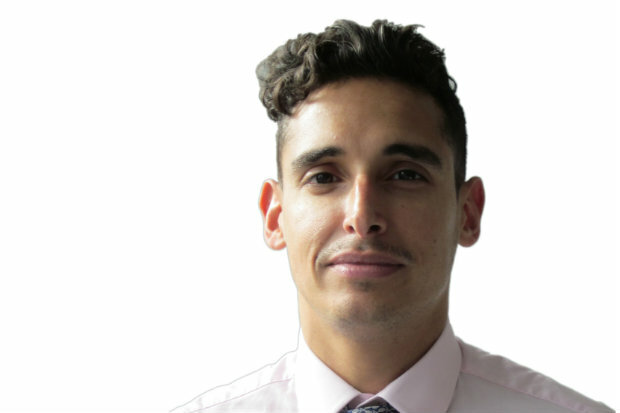 The GPhC’s Mr Ammar says that the relaunched mygphc.org website ­­marks the regulator’s move towards being a more online organisation. The site has been rebuilt so registrants can access everything they need in one place – and from mobile devices, which have proved problematic in the past – with revalidation being one of the first elements to go live. The GPhC has to provide assurance to the public and the rest of the healthcare community that the professionals it regulates are able to do the job they are expected to do. This means checking that pharmacists and pharmacy technicians have not only undergone training that equips them with the skills and knowledge to practise safely and effectively – which is achieved through accrediting courses – but also making sure they stay up to date with changes to practice. This is not a spur of the moment undertaking. The GPhC started working towards revalidation almost as soon as the regulator came into being in 2010. The process has been informed by specially commissioned research and advisory groups, which comprise representatives from NHS and pharmacy organisations, employers, education institutes and patients. Revalidation has been extensively tested – over 1,300 volunteers were involved over a period of eight months in 2016 – and evaluated, according to the GPhC. 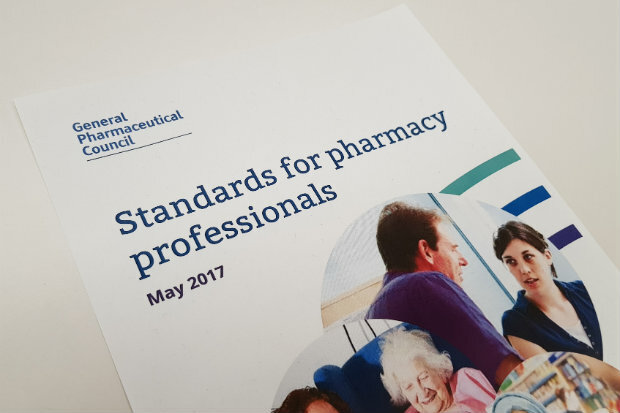 This was carried out before the framework – which details exactly what pharmacy professionals need to do each year in order to meet the regulator’s requirements – was finalised and published. More on the revalidation development process can be found here. Revalidation as a concept was first mooted in the 1970s, when a government committee floated the idea that perhaps it was unwise to assume a medical doctor was competent and up to date unless something happened to prove otherwise. Nothing was done until deaths at Bristol Royal Infirmary’s paediatric cardiac unit hit the headlines in the 1990s and the resulting public inquiry, headed by Professor Ian Kennedy QC, turned the spotlight on fitness to practise. It took a few more years for an acceptable model of revalidation to emerge, one that healthcare professionals viewed as concerned with improving quality rather than weeding out incompetence. Then in 2012, the General Medical Council introduced revalidation, followed by the Nursing and Midwifery Council in 2016. More information is given in the revalidation framework, which can be found on the GPhC’s pharmacy regulation website. C+D has addressed some of the concerns raised by readers during the revalidation proposals in this feature. Resources to help registrants complete their revalidations entries are available here. 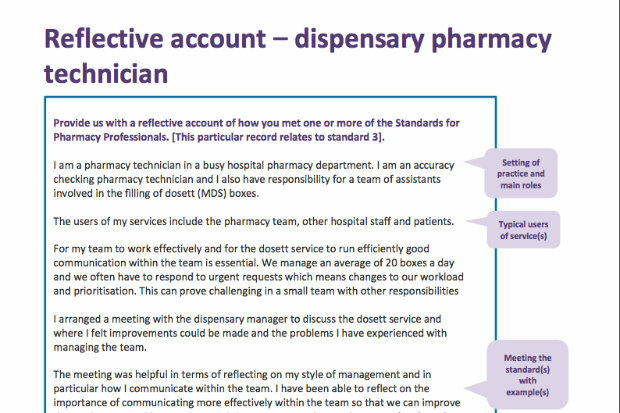 In addition, the GPhC has created a range of different example records for pharmacy professionals working across a myriad of roles. Click on each of the four tabs below to see some of these.